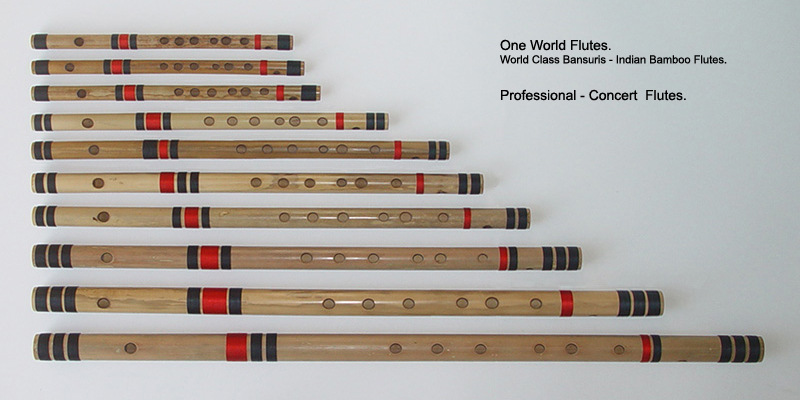 World Class Flutes, created by Flute CraftsMen that make Flutes for the Worlds' Leading Flautists, like Pandit Hariprasad Chaurasia, Pandit Ronu Majumdar. Professional Concert Flutes ..... A = 440 Hz. Natural Note, is listed with 'n'. 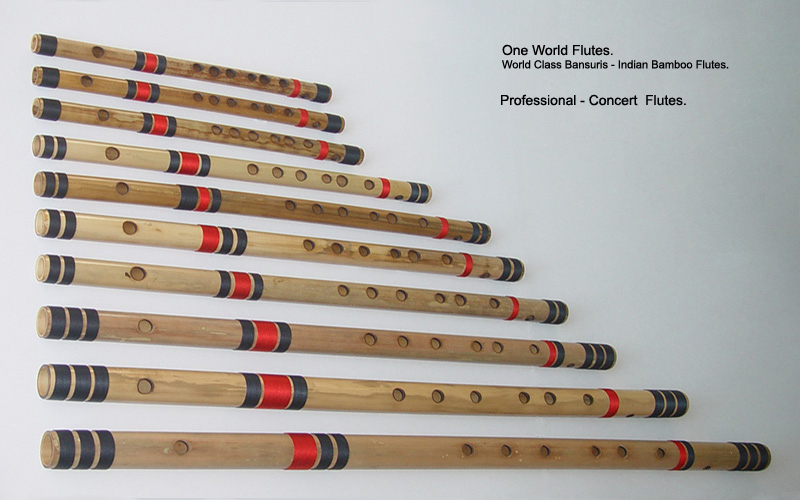 Example, Professional Concert Flute. C n.
Sharp Note, is listed as '#'. 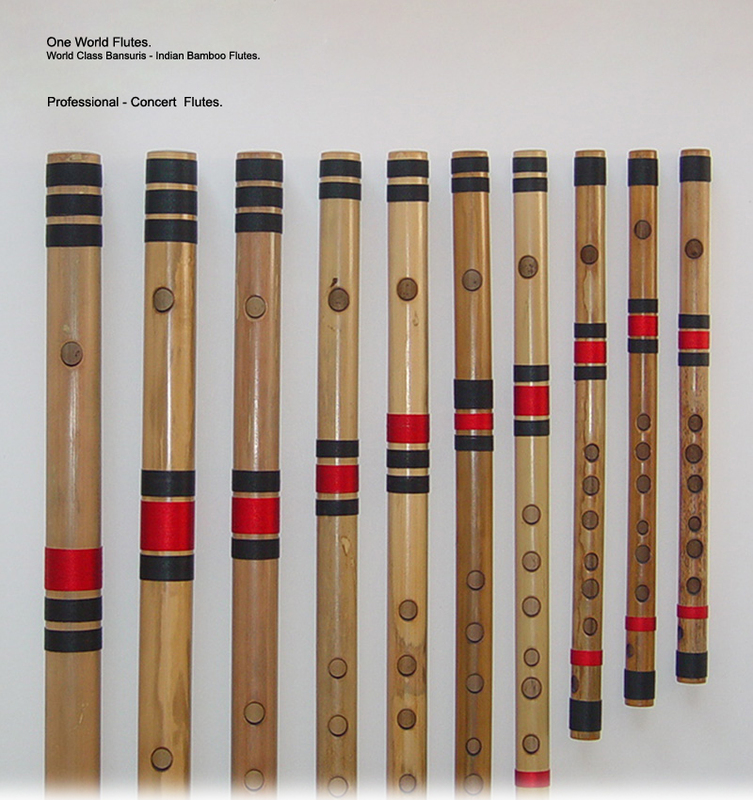 Example, Professional Concert Flute. C #. G #. Professional Concert Flutes. A = 440 Hz. L. D. Price. Notes. Professional Concert Flute. F n.
Tonic : F. Key : C. 10" 0.5" $65.00 F Natural. Small. Professional Concert Flute. E n.
Tonic : E. Key : B. 10" 0.5" $65.00 E Natural. Small. Professional Concert Flute. D #. Tonic : D #. Key : A #. 10" 0.5" $65.00 D Sharp. Small. Professional Concert Flute. D n.
Tonic : D. Key : A. 10" 0.5" $65.00 D Natural. Small. Professional Concert Flute. C #. Tonic : C #. Key : G #. 10" 0.5" $65.00 C Sharp. Small. Professional Concert Flute. C n.
Tonic : C. Key : G. 10" 0.5" $65.00 C Natural. Small. Professional Concert Flute. B n.
Tonic : B. Key : F #. 10" 0.5" $65.00 B Natural. Small. Professional Concert Flute. A #. Tonic : A #. Key : F. 12" 0.5" $65.00 A Sharp. Small. Professional Concert Flute. A n.
Tonic : A. Key : E. 12" 0.5" $65.00 A Natural. Small. Professional Concert Flute. G #. Tonic : G #. Key : D #. 13" 0.5" $70.00 G Sharp. Small. Professional Concert Flute. G n.
Tonic : G. Key : D. 13" 0.5" $70.00 G Natural. Medium. Professional Concert Flute. F #. Tonic : F #. Key : C #. 14" 0.6" $85.00 F Sharp. Medium. Tonic : F. Key : C. 15" 0.6" $85.00 F Natural. Medium. Tonic : E. Key : B. 16" 0.6" $85.00 E Natural. Medium. Tonic : D #. Key : A #. 17" 0.6" $90.00 D Sharp. Medium. Tonic : D. Key : A. 17" 0.6" $90.00 D Natural. Medium. Tonic : C. Key : G. 19" 0.7" $95.00 C Natural. Medium. Professional Concert Flute. B n. Bass. Tonic : B. Key : F #. 21" 0.7" $100.00 B Natural. Bass. Professional Concert Flute. A #. Bass. Tonic : A #. Key : F. 22" 0.8" $105.00 A Sharp. Bass. Professional Concert Flute. A n. Bass. Tonic : A. Key : E. 23" 0.8" $115.00 A Natural. Bass. Professional Concert Flute. G #. Bass. Tonic : G #. Key : D #. 24" 0.8" $130.00 G Sharp. Bass. Professional Concert Flute. G n. Bass. Tonic : G. Key : D. 25" 0.8" $140.00 G Natural. Bass. Professional Concert Flute. F #. Bass. Tonic : F #. Key : C #. 27" 0.9" $150.00 F Sharp. Bass. Professional Concert Flute. F n. Bass. Tonic : F. Key : C. 28" 0.9" $160.00 F Natural. Bass. Professional Concert Flute. Concert E n.
Tonic : E. Key : B. 30" 0.9" $180.00 E Natural. Bass. Or E. Bass. Professional Concert Flute. Concert D #. Tonic : D #. Key : A #. 31" 1.0" $195.00 D Sharp. Bass. Professional Concert Flute. D n. Bass. Tonic : D. Key : A. 32" 1.0" $215.00 D Natural. Bass. Professional Concert Flute. C #. Bass. Tonic : C #. Key : G #. 35" 1.0" $225.00 C Sharp. Bass. Professional Concert Flute. C n. Bass. Tonic : C. Key : G. 35" 1.0" $235.00 C Natural. Bass. 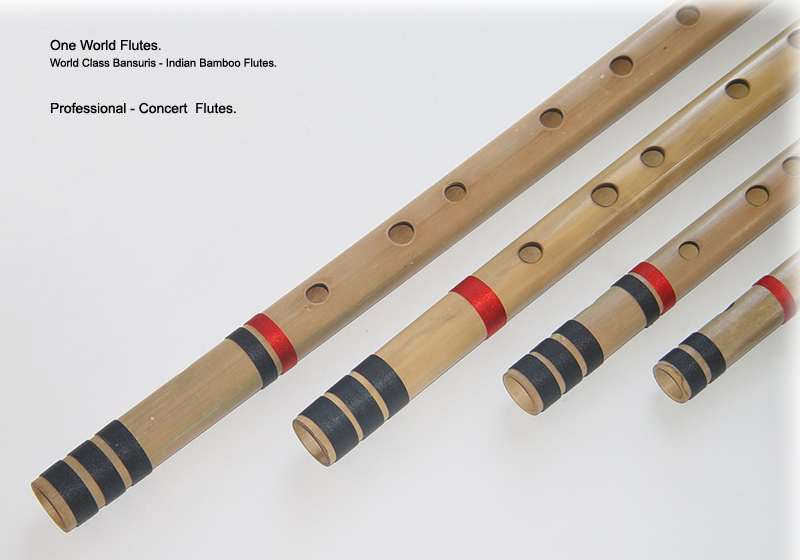 Most Bansuri makers take 6 months to a year to make you these due to Bamboo availability. At One World Flutes .... we have them ready to ship ! Professional Shankh Bansuris. A = 440 Hz. L. D. Notes. Professional Concert Flute. Tonic : B n. Shankh. 36 Inch. Professional Concert Flute. Tonic : A #. Shankh. 40 Inch. Professional Concert Flute. Tonic : A n. Shankh. 40 Inch.